Super Rare Games’ exclusive Mutant Mudds Collection physical release is now up for pre-order starting today. Every copy of the game will come with a 20 page full colour manual, reversible cover, exclusive sticker, cardboard slipcover, as well as three trading cards randomly selected from the five-card set. It retails for $34.99 / £29.99 / €33.99. There are only 4000 copies available. Purchase yours here. 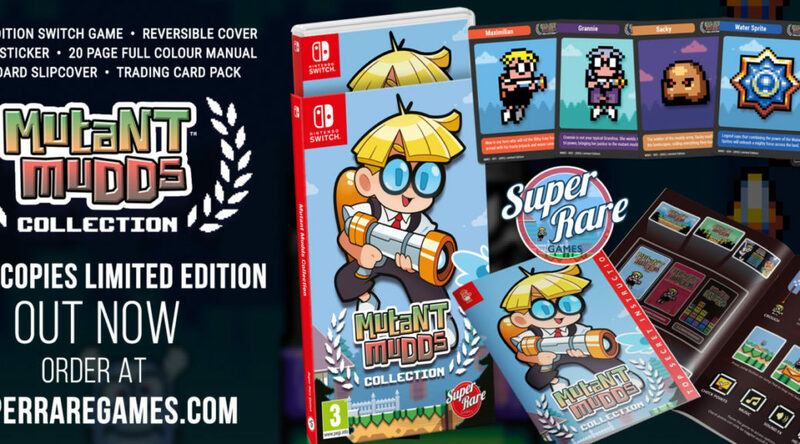 Super Rare Games have today announced the physical release of Mutant Mudds Collection for Nintendo Switch. Only 4,000 copies of this well-loved indie title will ever be available – and pre-orders are live now at superraregames.com. Mutant Mudds was developed by Atooi, an indie studio based in Austin, Texas, and has become a cult classic since its initial release in 2012 on the 3DS. The Switch Version contains three games in one, Mutant Mudds Deluxe, Mutant Mudds Super Challenge and Mudd Blocks. Each game offers players a complete experience and contains a unique set of levels and challenges. The Super Rare edition will include a 20 page full colour manual, reversible cover, exclusive sticker, cardboard slipcover, as well as three trading cards randomly selected from the five-card set. Excitingly, 125 of these cards have been signed by the development team of the game – making some copies even rarer. “This is a collector’s edition that I am extremely proud of and hope the muddy fans out there are as excited as I am to add it to their collection” Atooi CEO continued.